The effective Steem Power, which takes account the delegated and received Steem Power. The second line displays information regarding how the upvote will be rewarded to the author. Let's have a look what is displayed in steembottracker.com. The following table shows an example of the expected vote value from @buildawhale. 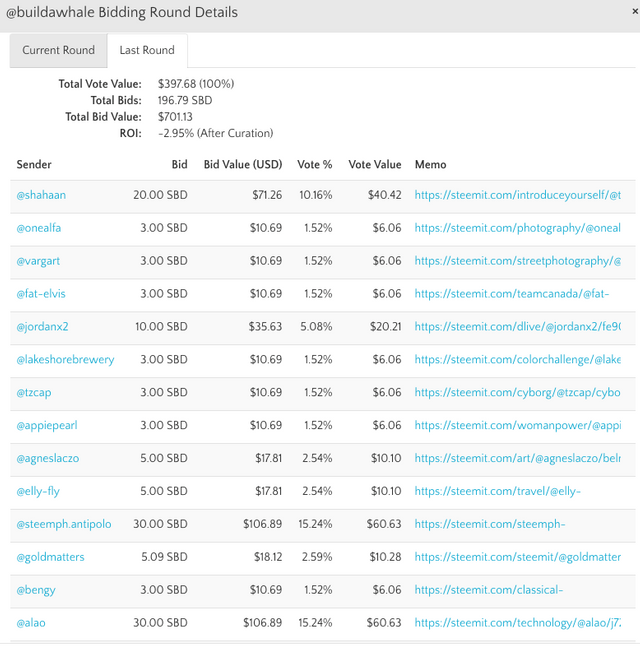 If you bid 3.00 SBD, for example, you will get $6.06 after reducing the 25% curators reward. However, the reward is split into SBD reward and SP reward, and you will get them after 7 days. 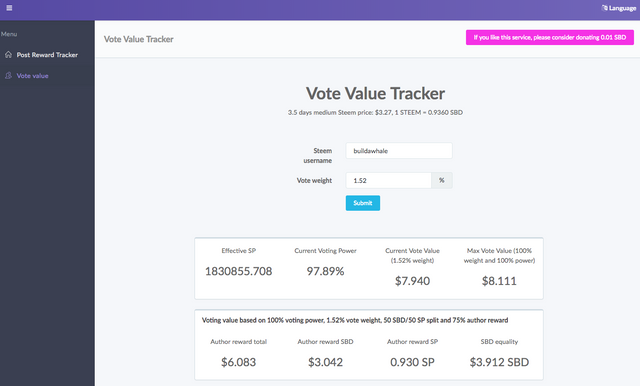 Considering you can by STEEM directly from Steem Dollar and power them up, this 'vote value' on steembottracker.com cannot reflect the ROI of the investment in SBD. A more detailed explanation on this can be found in my previous post. the value is awarded after 7 days. As a summary, you can use this tool before bidding for upvote and get an expected ROI in SBD. Please note: for those who have less than 500 Steem Power, there is no option on Steemit for you to choose your vote weight when you upvote a post. for we that are yet to gain ground here, any way forward? This post has received gratitude of 1.96% from @appreciator courtesy of @ethanlee!